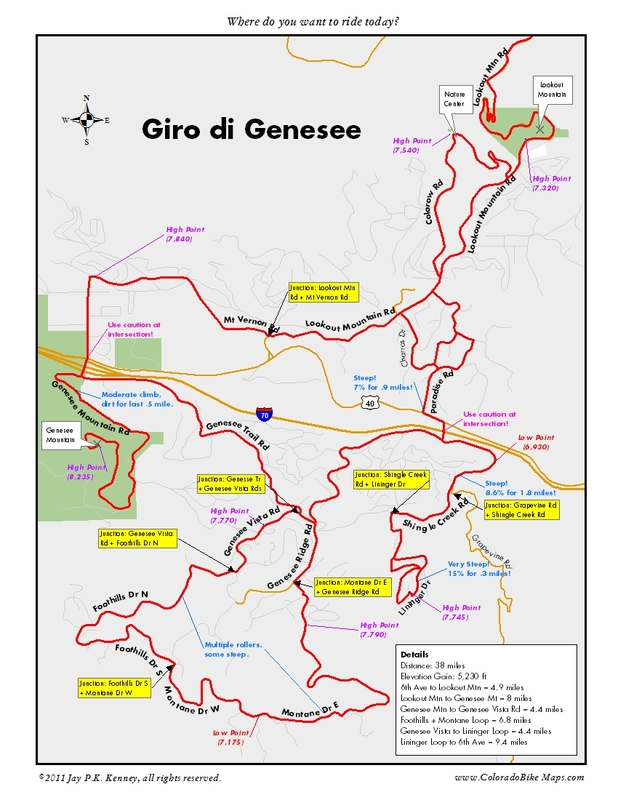 Once you’ve mastered Lookout Mountain, conquered the Nature Center and Mt Vernon Country Club, and overcome the final 1/2 mile dirt climb up Genesee Mountain, you’ll be ready for the Giro di Genesee, a 36 mile rollicking, frolicking, tour of the best that the Genesee area has to offer. The GG differs from the Genesee Mountain Loop in two important particulars. It adds a tremendous set of steep rollers in the quiet, far south of the development, along Foothills and Montane Drives, and for the climber within, it offers one of the best short steep climbs in the Front Range, the Lininger Loop. Start somewhere in Golden, along Illinois St, at Ulysses Park, or even at Lookout Mountain itself. The possibilities and permutations of this ride are endless. Ride up Lookout, pass by the Nature Center, wave to the tennis players at Mt Vernon Country Club, and snort at the bison in Genesee Mountain Park as you climb to the top and enjoy the views to the west of Mt Evans. From here, make a long descent along the Genesee Trail Rd and climb briefly to a high point on Genesee Vista Rd. If you’ve got mechanical troubles or just need a pick-me-up, drop into Foothills Ski & Bike or the Buffalo Moon Coffee Shop, both just up the hill from Exit 254 near the Chart House. Within the Genesee development, the route finding can be tricky, but only because the names are so similar: Genesee Trail Rd to Genesee Vista Rd to Foothills Dr N and S, to Montane Dr W and E and finally back to Genesee Ridge Rd. The trickiest turn for me in my earliest ventures here was from Genesee Vista Rd to Foothills Dr N–it comes up on you quickly on a fast, sweeping descent. If your spirits or your energy flag en route, there are a couple of shortcuts to relief: from G Trail Rd to G Ridge Rd (shown in red); from G Vista Rd to G Ridge Rd; and from Foothills Dr N back to G Vista Rd. The Foothills Dr and Montane Dr sections of the Giro face south and look down into the Bear Creek watershed–the views are spectacular. A fast descent brings you to I-70 and exit 256. From here, choose to return to the Lookout Mountain area and Golden by riding up Paradise Rd (a better way than the traditional Paradise to Charros that all the cars take) or head out to the little-known Lininger Loop, best ridden clockwise to get the most out of the steep climbing found there. From the stop sign at exit 256 follow Grapevine Rd to Shingle Creek Rd, then Lininger Dr up and around to Winston and Hagler drives.